birdRS: Singing in the moonlight - variation in the dawn chorus related to moon phase and visibility. Research paper from Exeter and Bristol Universities. Singing in the moonlight - variation in the dawn chorus related to moon phase and visibility. Research paper from Exeter and Bristol Universities. Singing in the moonlight: dawn song performance of a diurnal bird varies with lunar phase. York JE (1,2), Young AJ (1), Radford AN (2). Jennifer York and colleagues collected data between October 2010 and April 2011 from a colour-ringed population of a diurnal bird, the white-browed sparrow weaver (Plocepasser mahali)at the Tswalu Reserve in the Kalahari Desert, South Africa. They investigated how two aspects of the lunar cycle—moon phase (new or full) and moon position at dawn (above or below the horizon) affected the dawn chorus. Signalling at twilight has been shown to be important for asserting territorial and reproductive advantages over other rivals. Those singing longer and louder can more clearly allow their potential to be assessed by the female birds. 19 male birds we recorded before emerging from their roost; the full repertoire of their song was noted and tested against the moon phase and position. The figures below summarize the trends in the data. 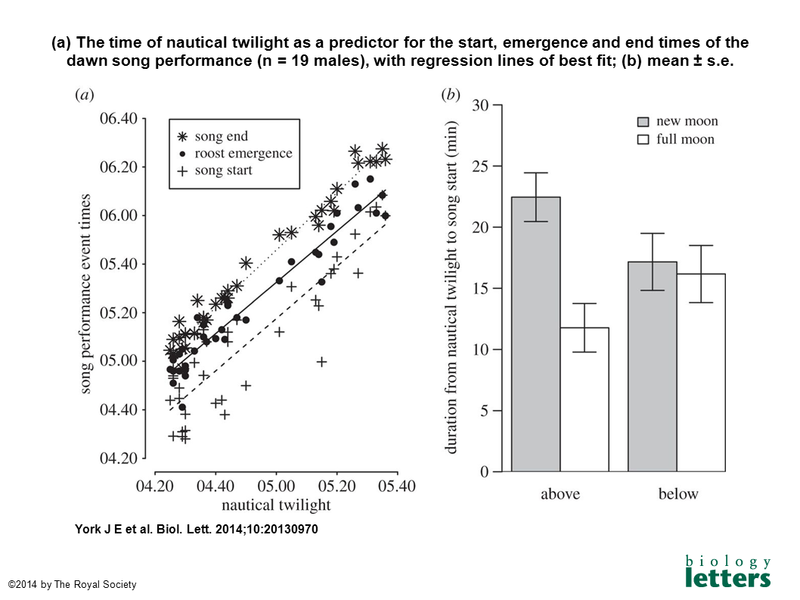 (a) The time of nautical twilight as a predictor for the start, emergence and end times of the dawn song performance (n = 19 males), with regression lines of best fit; (b) mean ± s.e. (from LMM) duration after nautical twilight that dawn song started (moon above the horizon at dawn: n = 11 males; moon below the horizon at dawn: n = 8 males). 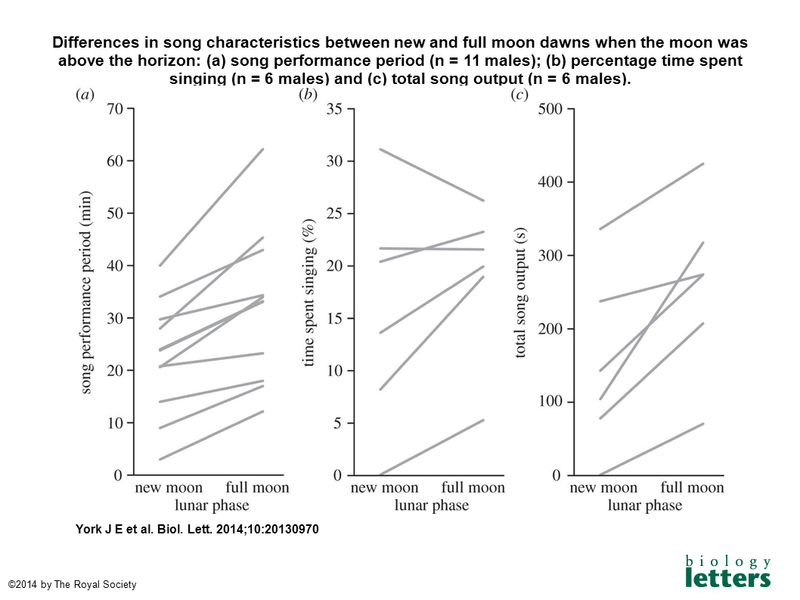 Differences in song characteristics between new and full moon dawns when the moon was above the horizon: (a) song performance period (n = 11 males); (b) percentage time spent singing (n = 6 males) and (c) total song output (n = 6 males). Shown in all cases are values for individual males, with those from the same male connected by lines. This study shows that the white-browed sparrow weavers would change their daily routine according to moon phase and position. At dawn, when the moon was visible, the songs started earlier and were sung over a longer performance period, when the moon was full. As it is suggested by the authors that it is lunar illumination rather than actual moon phase that is underpinning the data, it is left just to speculate how much light pollution in the UK may affect our own resident species, and whether species are evolving or adapting to these changes.